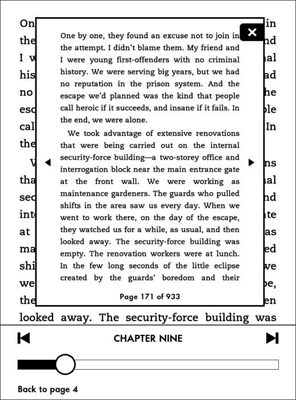 New to the second-generation Kindle Paperwhite, Page Flip enables you to move quickly through a book and return to your original location, without setting a bookmark. To access Page Flip, swipe up from the bottom of the screen. You’ll see a screen within the screen, as shown in the following figure. In the middle of the page, note the left and right arrowheads. Tap these to move forward (right) or backward (left) one page at a time. You can move forward and backward through a book also by swiping across the screen. At the bottom of the screen is a rectangular navigation pane that displays the current chapter and location. Tap the arrows to move forward and backward by chapter. (If the publisher hasn’t set chapter marks, you see only the progress bar.) You can slide the circle on the progress bar to move forward quickly by location — think of this as riffling through the book. Tap on the bar to move to the beginning of a chapter. When you’re finished, tap the X in the upper-right corner to close Page Flip and return to your reading location. Page Flip is a handy feature because it allows you to quickly move through a book without losing your place. Do you need to refresh your memory on a character’s name? Does the book contain maps or photographs? Use Page Flip to navigate to these types of features. You can use Page Flip to quickly jump to a different part of the book (if, for example, you’ve lost your place and didn’t set a bookmark). After you’ve flipped to the correct location, tap the center of the page view screen to jump to that location. The size of the font in the page view screen is smaller than the font on the page you’re reading. If the Page Flip view is too small to read, increase the size of the font on the page and then restart Page Flip. You can’t directly increase the font size within the inserted page that you’re viewing on the screen.